Romania is one of those countries a foreigner enjoys best after getting to know it in depth. It may take a while to go past the first impression (which often is a bad one…), and discover the real Romania. Here's how you can speed up the process. You can either let time pass and hope to meet helpful locals to show you the ropes and the real Romania (they’re essential), or you can get a travel guide which lays the essentials. Or you can get both! We’re the locals (and long-time foreigners who love Romania and live here) who will help you find your next favorite shop, your next holiday destination, the most suitable route. Handpick hotels in Bucharest and elsewhere in Romania, send you to the best places at the seaside and mountains, and uncover some lesser known places in Bucharest that are well worth a detour. 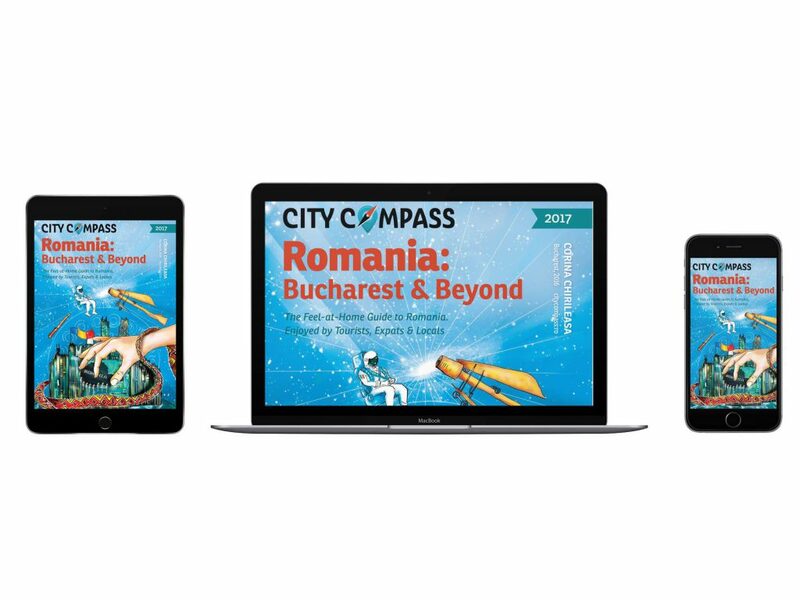 We’ve put together the knowledge of 17 Romanian and foreign contributors in our freshest travel & expat guide in English – City Compass Romania: Bucharest & Beyond, the 2017 edition. It has intercultural info, tips & tricks and real stories from people who actually live here! It is a very practical handbook that will save you time and nerves (so our readers have told us). Everything you need to feel at home in Romania! Even Romanians love it, as it helps them discover new things about their own country through the eyes of foreigners. You can read it in hardcopy (we also do international delivery), or download it super fast in three digital formats: PDF (full design, stunning layout and pictures), ePub (for iBooks) and .mobi (for Kindle readers). "Not your usual tourist guide, but very helpful. There's a lot of really useful information to help you through the culture shock period, and a great deal of practical advice. For vacationers and casual readers, there's also extensive restaurant and cultural attraction lists, a sector by sector market guide, and an excellent guide to the workings of Bucharest's mass transit system. The most practical guide I've run across"
"The book is a complete and universal guide to everyone who plans to live or lives in Romania. Also for the seasoned traveler it offers great advice." "A must-have! Well done! Comprehensive, well-written, and way more than I was expecting. I just wish I had found it before I arrived in Bucharest." Bucharest neighbourhoods, including the Old Town & Pipera – the expat neighbourhood. Bucharest business directory, on major areas of interest: hotels, restaurants, hospitals, legal & business, house & home, travel & many more. It is much easier to discover and enjoy Romania with this handbook. Get your free book extract now at RomaniaBucharestBeyond.com.